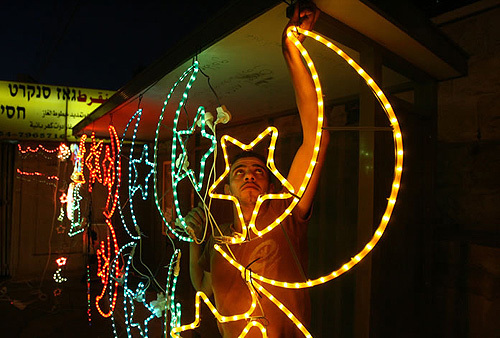 Ramadan without sparkling decorations is just not worth a celebration. The celebration is well complemented with some sparkling crescent shaped decorations and many more. Continue reading so as to imbibe ideas with which you can give your house a festive look. So what are you waiting for? Start decorating your place and enhance the mood of festivity at its best. And if you feel the article was of any use to you, to consider referring this page to your friends and near ones so that they could as well decorate their place as beautifully as yours. Ramadan is going to arrive soon. This month will be as exciting as most of us decide to make it. Plenty of Muslim families will make all preparations to try and celebrate this special month to the fullest. Decorating their houses is a good idea. This portrays a cheerful ambiance on these special days and is really important. Celebration of Ramadan doesn’t necessarily need a large and expensive budget which makes this celebration even more exaggerated than required. But with basic ideas, you can prepare something so special and creative that it touches your soul. This is whole point of Ramadan. These are some of the ideas for paper decorations to depict Ramadan celebration. With these Ramadan Paper Decoration Ideas, along with a mix of your effort and imagination in the way decorations are chosen and displayed, gives warmth that only a blend of celebration and spirituality can sum up. 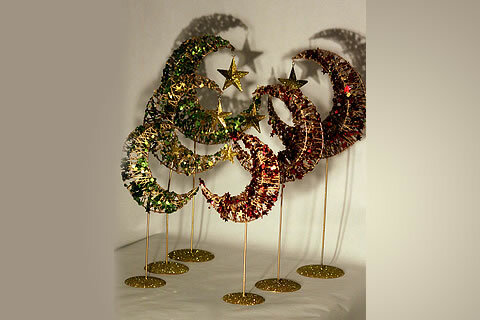 Since the purpose of these decorations is for Ramadan, you must use paper which is instantly greeted with the colors and shapes of the season, namely gold and silver. You can start by using a piece of foam and trace it out in the shape of a crescent. The foam can be, for example, about 21 X 24 inches. After that, you can use a toy tub, preferably big, to trace out the shape. You could also try and do it free hand if you are more comfortable. After tracing, use an electric foam cutter to cut out the shape of the crescent. If you don’t have one, a craft knife could do the job, you have to be very precise. Bear in mind to not force the foam cutter should you choose to use it. Gently let the cutter glide on the foam as it heats its way through. Also, be sure to place the foam on a flat surface when cutting. You may notice that the final shape will not have a smooth outline. So you must be very careful. Another thing can be done. You could purchase a piece of circular flat florist foam and chisel out a crescent shape from it. Once you have your desired shape, spray paint the shape gold or silver matching any ornaments you want to attach. This step may be omitted if you want. But it is better to not let the white foam show. Don’t worry; things won’t go perfectly as you want. You will encounter hiccups. The important thing to remember is that this crescent shape will just be the skeleton to the real decoration. As long as it can support the ornaments and compliment them, Insha-Allah you’ll be fine. Now you must glue ornaments around the perimeter of the crescent. You could also make a small hole and run a ribbon through it. It would serve as a means of hanging up the decoration once it is complete. Add a second layer of ornaments in between the first layer. Keep repeating the process until the whole shape is covered. It gets a tad bit tricky filling up the middle part of the crescent. You have to figure out the best way to fill your crescent with ornaments. You could use gold or silver ornaments and try and keep them all of the same size. However, to really distribute the colors evenly and cover the entire crescent well, it would be better to get ornaments of different sizes. That way you can use small ones for the tips and the big and medium ones for the main body. This is a little project to make it for fun the children and pretty all the same. 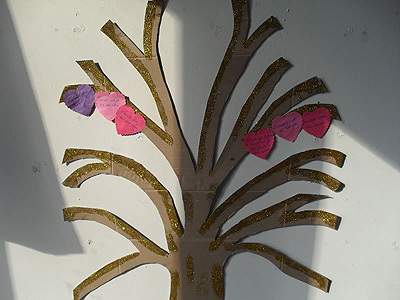 It helps the kids in encouraging them to perform more good deeds in this sacred month. It is basically a tree in which the flower blossoms when they do a good deed. The steps of making one are below. You will require a flower pot, florist foam, a styrofoam ball, a stick or dowel and some pipe cleaner to wrap round the stick. You can purchase all of this from a nearby store. Begin by cutting the florist foam into shape so that it fits into your chosen flower pot tightly. Then, gently push the stick through the foam enabling it to stand out of the pot. At this juncture you could wrap some pipe cleaners all around the stick if you choose. Finally push through the styrofoam ball till it is about three quarters through into the other end of the stick. You can stuff some tissue paper inside the base of the tree to conceal the florist foam. You could also use some sticker letters to decorate the pot. For making the flowers, use a die to cut out flower shapes from card stocks. Make a little hole using a paper piercer in the middle of the flower and push colored toothpick through for the stem. There are various other options for this. You can purchase flower shapes which are precut and made out of foam or card stock at most craft stores. You can also purchase flower punchers to punch out flower shapes. Festive window clings are always fascinating. Ramadan is the perfect excuse for trying to paint some. The design is best done on wax paper. What you can also do is print out pictures related to Ramadan and place them inside a page protector. Ramadan themed coloring pages work quite for this decoration. Then paint the picture right on top of the page protector using the printout as a guide. It’s best to use Scribbles 3D Dimensional Fabric Paint for this decoration. Let the painting dry overnight. Finally, gently peel it off the page protector and place it on the window. 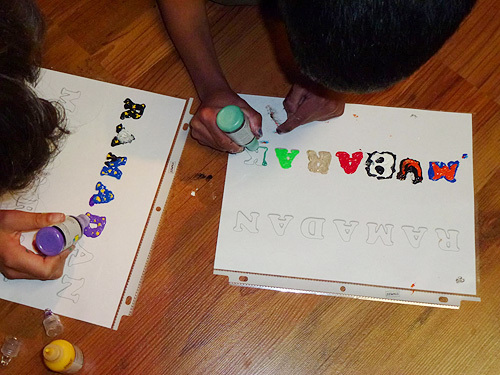 You can use this activity as an excuse to teach your children some craft. Your children will be able to practice their button skills and pincer grip skills. Start off by gluing strips of paper onto one side of a cloths pin. You can use some coordinated scrapbook paper to make it look prettier. Then glue some chocolate onto the plain side of the cloths pin using a children’s favorite, glue gun. Once you’re done with that, clip the pegs around the perimeter of a suitable container, preferably circular, with the paper side out. An example would be to use a plastic popcorn bowl. You could also get a charger plate and attach stack of sticky note in the centre. Then, stamp the sticky notes beginning from the number 30. The objective is for the children to remove one peg a day from the bowl. They will of course eat the chocolate and then clip the peg around the object you used. After that they can remove one sticky note each day to unveil the number of days left before Eid. 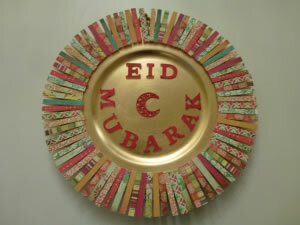 Insha-Allah, the objective is to fill the perimeter of the object and, if you used a circular plate, by the end of Ramadan you will create an Eid wreath. This was just a glimpse of what you can achieve if you put in a little effort. So why wait? Go out there are use your imagination to create something truly spectacular.